This pie is a revelation. Well, I might be taking that statement a bit too far but it was fantastic. It started with a simple fudge pie recipe that I have loved for years. 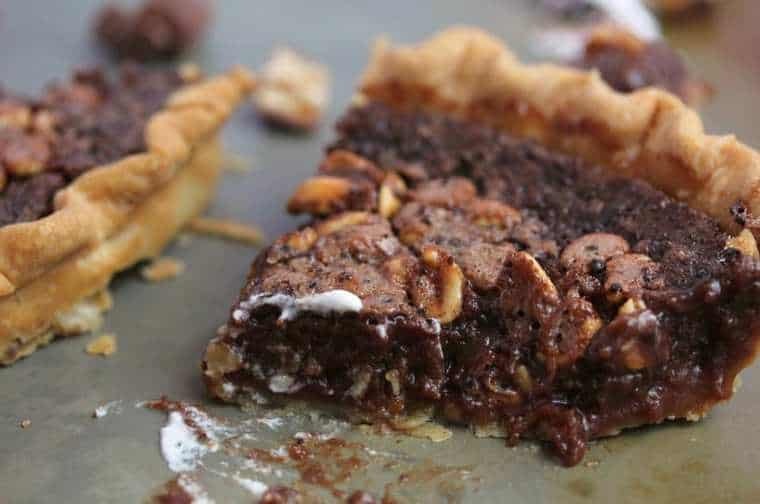 It is essentially the chocolate fudge pie recipe from the movie, “The Help”. I have made this pie for parties at my home and even for my birthday a few years ago when I was going through a no-cake phase (it only lasted two weeks). I just adore this fudge pie. The taste reminds me of a fudgy brownie, perfectly chewy and chocolatey, but with a flaky pie crust bottom. It really is the perfect chocolate pie. My thought was to see how I could make this pie even more fun. Immediately candy bars floated around in my mind. I am not a big eater of candy bars I must confess. I have a dad for a dentist so I really never gravitated towards them but if there was one I would indulge in every now and again, it would be a Snickers. First, it has peanuts and that is the only nut I am not allergic to, probably because it is technically a legume and not really a not. Secondly, I love the peanuts with the gooey caramel and chocolate combo and thought I could add a bit of that flavor to my pie. I started with my trusty and added a thin layer of caramel sauce with peanuts then topped it with the fudge pie mixture and baked for 50 minutes. Holy Moly, was this soooo delicious!!!! With a garnish of fresh whipped cream and chopped candy bar, I was ready to devour this, and you will be too! Roll Pillsbury refrigerated pie crust into your pie pan and prick bottom with a fork. Next, add unwrapped caramel, butter, and evaporated milk into a microwave safe bowl and microwave 20-30 seconds at a time then whisk together until caramel has completely melted and is a smooth consistency (takes about 1 minute and 15-30 seconds). Spread caramel sauce on the bottom of the pie crust. Top with salted peanuts and press down into the caramel. In a large bowl, whisk together sugar, cocoa powder, salt, butter, eggs, evaporated milk and vanilla extract until well combined. Pour fudge mixture over caramel nut crust bottom. Bake for 45 minutes or until outsides of pie are set but inside is still a bit jiggly. Remove and cool completely on cooling racks. Garnish with whipped cream and chopped candy bar and serve. I haven’t actually tried it but I know. Just look at it! By the way, I LOVE those Pillsbury refrigerated pie crusts. So much better than the ones that are already rolled out in the pans! Thanks so much Erin! I feel the same way about the refrigerated pie crusts. 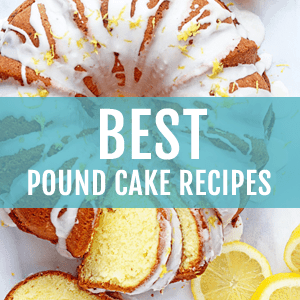 Super yummy and convenient! That caramel nut crust in itself sounds to die for!! Looks amazing, girl! Yes! The premade pie crusts are seriously the best things ever when you are a beginner or just out of time period! Yes, serious dessert indeed! Thanks so much! Oh yes! This must go straight to the top. No exceptions! I had a brief no-chocolate phase. It lasted 4 hours! It was epic. And then I saw this pie. Gosh four whole hours girl? How in the world id you manage? hahaha agreed! I guess Snickers is pretty popular. 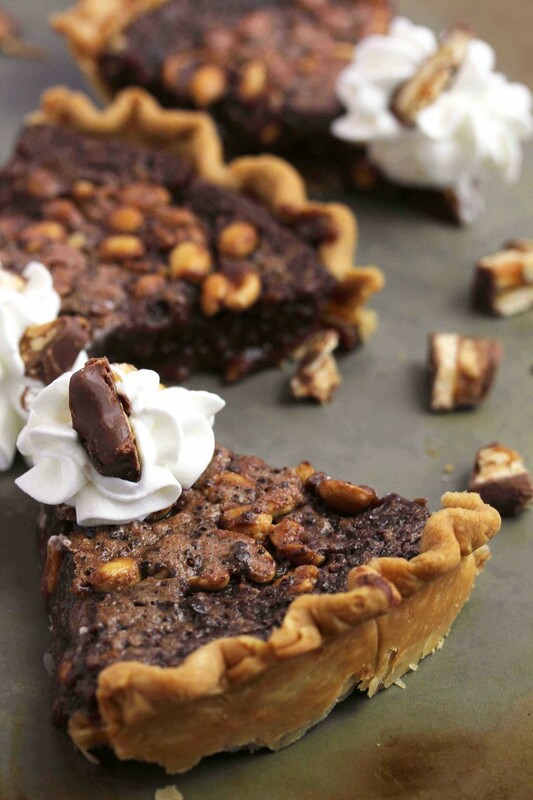 It is the only candy bar I happen to like and putting that flavor in this pie was divine! That is a pie revelation! I could go for a slice of that right now! Oh my goodness!! I must admit I’m not much of a chocolate bar person myself either, but I could definitely go for a slice or two of this pie!! Oh yeah Jessica! I don’t do a ton of chocolate but definitely had my fair share of this. GIRRRRRRRRRRL! This pie is so epic-ly amazing!! I love the caramel and peanuts and that fudgyyyyy filling! Thank you so much Kayle! I think I can agree after several slices of it. Holy heavens above. This looks AMAZING! I knew coming here would be risky, but I couldn’t help myself after seeing your IG post. YUMMMMM! 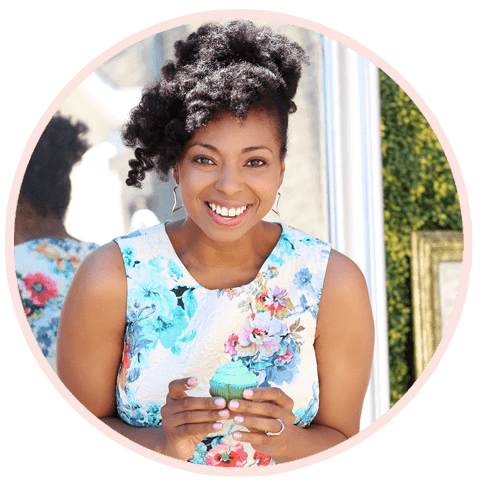 I am so glad you decided to come on over Jacquee! Thanks for coming over to the dark side! Thanks so much Joanne! It is indeed super fudgy! Kind of like a fudgy brownie, perfectly chewy and chocolatey, but with a flaky pie crust bottom?!!! Oh my gawd, WANT!!! Looks sooooo good!! Happy friday, woot woot!!! YES!!!! It is insane. Thanks girl and happy Friday to you too! I think I gained 10 lbs from just looking! This sounds amazing and looks so fudge!! Oh oh oh. I am getting the weak in the knees reaction. 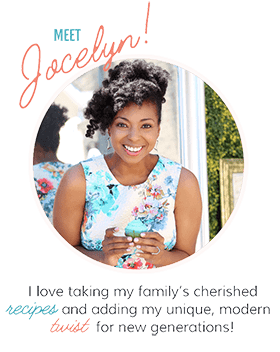 Jocelyn, this pie … like, no words! Candy bar, fudge, and pie in one recipe! Pinned! Thanks so much Mary! This pie literally weakened my knees too! 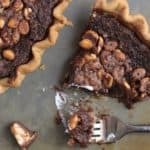 Love how rich and fudgy this pie is! Thank you so much Olivia! I am so grateful you found me too! I loved that book too girl! I also laugh a bit. So glad this pie doesn’t have any of what Minny’s pie had in it lol. Oh man this looks like my kinda pie! 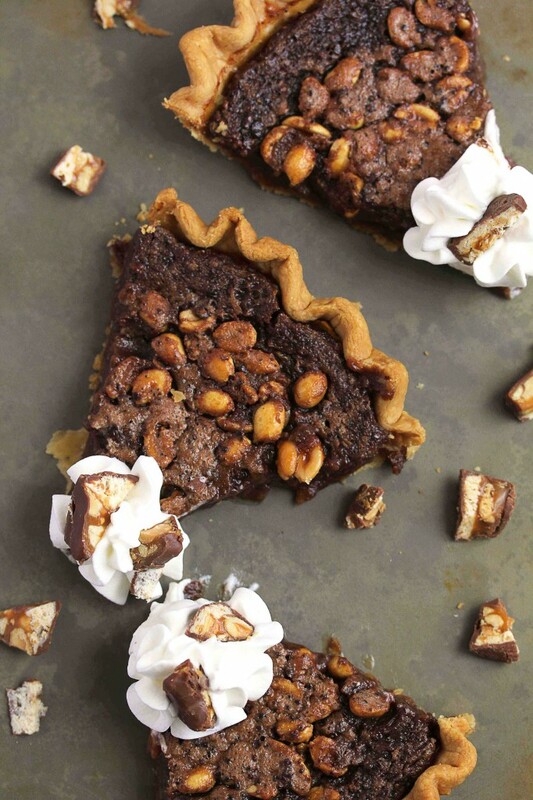 Ummm…Snickers-esque fudge in a pie crust?! Ermagaaaaawd yes! 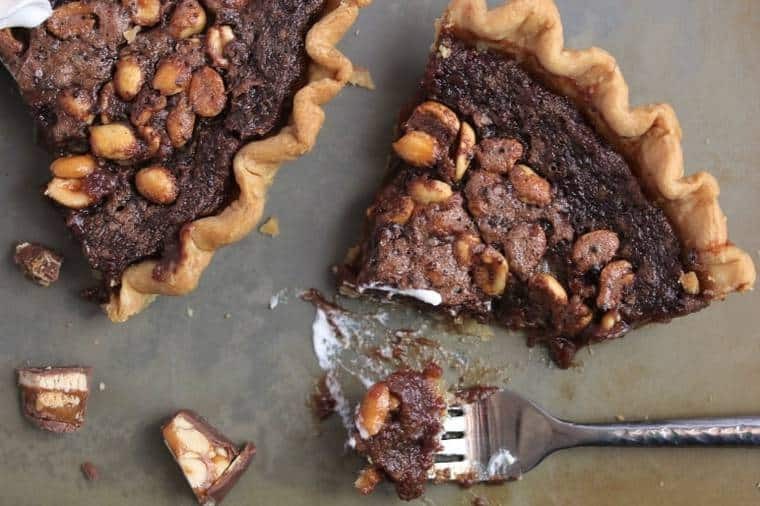 This is my dream dessert – I looooove pie crust (I could just bake a crust and eat it by itself, no filling) and Snickers, one of my fave chocolate bars. Brilliant! Hooray thanks so much Nancy!! I adore pie crust too! This looks amazing! 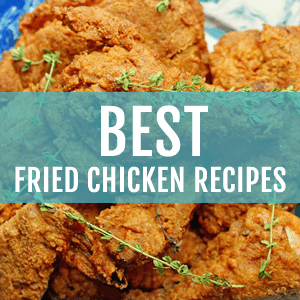 Definitely a recipe to try out! Oh goodness gracious, this fudge pie needs to find it’s way to me because I’m calling for it. You got me craving hard Jocelyn! YUM! Thanks so much Pamela!! I love calling for pie! Something about a snickers bar that is pretty irresistible right? YES! Girl, YES!! You have no idea what I would do to this. I’d eat it all! Love how you styled it too! Aww thanks so much Connie! Girl I couldn’t stop eating this pie lol. Wow Wendy we seriously have the same allergy and candy loves! Sounds like this pie is a match made in heaven! Hahaha so long as your pie isn’t literally the pie from The Help where she added her own special ingredient! But seriously this pie does sound amazing. Hahaha exactly Erin! Now that pie is one to give to your enemies right? Momofuku milk bar crack pie better move over ’cause there’s a new pie sheriff in town! This pie…… man looks sooo damn good. Uh I need a dish of this to myself with some ice cream too! 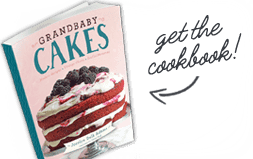 Oh yeah ice cream would be killer with this recipe girl! Hahaha Thanks so much Melissa!